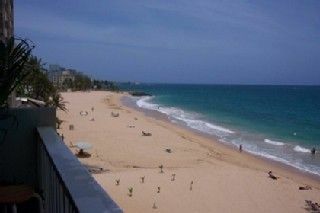 Oceanfront Condo on Beautiful Condado Beach in San Juan - FEMA Friendly! Come discover the Puertorican experience! As an alternative to a simple hotel room, this condo offers an entirely different vacation experience. It will be like having your own private home, directly on a lovely Caribbean beach. sand beach directly below you. This is not just a pretty view. You are ON the Beach! The unobstructed 180 degree view is breathtaking. The sliding doors in the living room open completely to your private balcony, so the beach becomes part of your living area. The living room and dining area are spacious, and provide lots of room for entertaining, or just relaxing. The living room sofa is a full sized futon and opens into a full sized bed, so the condo can accommodate 4 adults. The kitchen is a separate room Instead of going 'out' to eat for every meal, you can cook 'in' if you prefer, as you have a complete kitchen, with everything you need to prepare gourmet meals. and the sound of the waves will lull you to sleep. The bed is Queen sized with an extra thick mattress. There is a Pack 'N Play available for younger children. and many other amenities. The condo is fully AirConditioned. All you need to bring are your clothing and music. ride from San Juan airport (Muniz Marin) or a 10 min Taxi from the cruise ship docks. elevator). The building is very secure. The property is fully enclosed and gated. dryers (cost is $2.00 per load). to the highways that will get you to the rest of Puerto Rico. If you decide to rent a car, there is free parking for stays of 2 weeks or longer. For shorter stays there is a low daily rate available for unlimited in/out parking. Condado is a 'walking area', you don't need a car to get around. Shopping, restaurants, casinos are nearby. and buses are always available as the 'main drag ' is a half block away. UBER has come to PR and is an excellent, reliable, and inexpensive way to get around the San Juan area. This is not just a pretty view. You are ON the Beach! San Juan Airport is a 10 minute drive/taxi ride away. Very secure property, with private Lobby, and Elevator. Walking distance to all attractions within San Juan, a 5 minute taxi ride to Old San Juan, and close to the highway to 'El Yunque' rain forest and the rest of Puerto Rico. TV (Cable), VCR/DVD, Wireless Cable, CD player, Tape Deck, Phone, Air Conditioning. Fully Equipped Kitchen: Refrigerator , Stove, Microwave, Blenders, Juicers, Coffee Makers, Toaster Oven. Activities:: Condado Beach is a very beautiful, clean (beach sand is screened nightly), and well maintained beach. Excellent for Body Surfing, Swimming, Parasailing, or Just Relaxing on the Balcony and Admiring. Area:: Old San Juan is a 5 minute Taxi ride away. Explore the entire 16th Century Walled City in an afternoon. 'El Yunque' Rainforest is within a 30 min. picturesque drive away. Explore the underground Caves at Cumuy, or the Stellar Observatory at Areciebo. Ponce, Puerto Rico's second largest city is within 2 hours. The trip over the mountains is worth the drive. Full Kitchen with all appliances, pot/pans, dishes, glasses, and utensils. The most perfect location for our first visit to Puerto Rico. The condo was absolutely amazing! You couldn’t ask for a more perfect location for a beach vacation. Directly on Condado beach, the condo gave us direct access to the beach, and when we weren’t down on the beach, we had a spectacular unobstructed view of the ocean. If you crave the ocean, this is the location. Amazing stay at an amazing place! We had an amazing stay. Very clean and very close to all the places we wanted to see. Thanks for letting us enjoy your wonderful property. ﻿I would definitely stay at Fred's condo again. The location and the view were breath taking. Fred was very accommodating to us while planning our trip there. You can walk a few steps from the condo and enjoy the beautiful ocean. View from balcony was unbelievable. Shops and restaurants were in walking distance. No need to rent a car. Took a tour bus to La Mina Falls. Booked our trip to the falls right next door at the Marriott. The trip was a 10! Oceanfront Condo on Beautiful Condado Beach. Condado Beach is the Tourist / Beach area of San Juan, Puerto Rico. Center of fine restaurants, Casinos, and fine shopping, directly on the beach, and only a 10 minute drive from San Juan Airport. Close to all highways to get you to the rest of the island, El Yunque rainforest, and a short ride (5 min.) or a scenic walk (45 min.) to Old San Juan and the cruise ship area.